All the component parts of the CV1800 can be obtained separately, although this is often the most expensive option. It does however mean that should you damage any part it is replaceable. The Australian and New Zealand CV1800 supplied as a standard unit include the motor, the motor plate, the 406 mm impeller complete with the impeller housing and taper bearing, the cyclone body and cone assembly the flexible hose to link up with the bin together with all the fastenings to put it together. 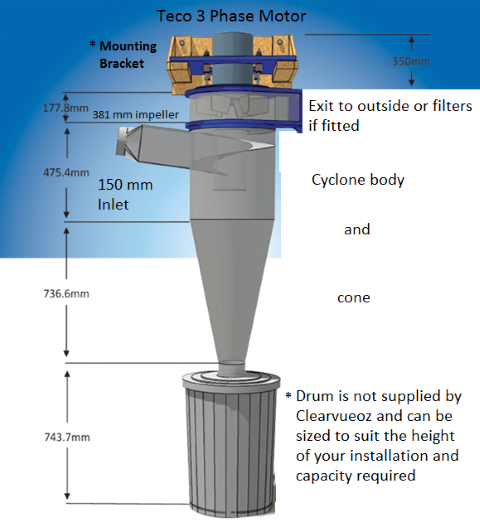 Clearvue cyclone bodies are built from heavy gauge 3.2 mm (1/8″) thick patented copolyester (PETG) plastic. This includes the best qualities of both acrylic (Plexiglas) and poly carbonate (Lexan). PETG plastic has the toughness and scratch resistance of poly carbonate. It is cold forming which means that, at room temperature, it can be bent to 90 degrees without breaking. It is also very impact resistant. Additionally, it has the cost effectiveness of acrylic without being brittle. Our cyclones are ‘thermo-formed’ over machined rounded forms, making them as true to a perfect circle as possible. All seams on our cyclones are of an offset lap type joint. This makes the inside of the cyclone very smooth keeping air turbulence and friction to a minimum. The CV1800 is designed for workshops where normally on single machines are used at any time. The inlet requires a minimum of 150 mm (6″) for the main duct. The main duct can be split into drop lines to each machine to fully utilize its capacity. Blast gates should be fitted to each drop line as close to the main duct as possible. We recommend that wherever possible you modify any dust ports on machines that are less than 150 mm (6″) to make them at least 150 mm. If the ports cannot be enlarged you will see a great benefit from providing more than one collection point. We can supply conversion transitions to take one 150 mm down to two 100 mm connection point. This allows you to take the 150 mm extraction duct or flexible hose as close to the machine as possible. Some customers will need to add filters as they may not have access to exhaust the virtually clean air externally. Most customers will need a VFD (Variable Frequency Device) which allows the unit to work with a single phase 15 amp circuit. This unit also allows flexible speed control and a soft start facility. We recommend that even users who have access to 3 phase power use a 3 phase to 3 phase VFD. This will provide the benefits of flexible speed control and a soft start facility. Main duct size: The machine requires a main duct of at least 150 mm. The Australian standard is 152 mm, which fits fine. The price for current stock of CV1800 in standard configuration is $ 3,064.00. This includes $ 278.54 of GST. This price does not include the cost of freight from our warehouse to your location. We will obtain an exact transport cost once we have your details, alternatively, we can organise to make units available for collection to save on this cost.